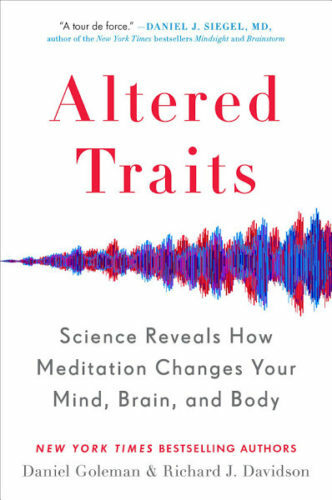 A Review of Altered Traits: Science Reveals How Meditation Changes Your Mind, Brain, and Body by Daniel Goleman and Richard J. Davidson. If you are a practitioner of Buddha Dharma for whom the pillar of great faith is unshakeable, I predict you will have no interest in this book. It is not really a book about the Way, as Zen refers to itself. An alternate title might be “This Is Your Brain On Meditation.” It’s more for wobbly people like me, forever dogged by doubts about what we’re supposed to be doing and whether it’s working. I’ll take validation and encouragement wherever I can find it. In this case it comes from a couple of long-term meditators, a psychologist and a neuroscientist, whose collaboration started at Harvard in the early 1970s. Based on experiences they’d each had at spiritual retreats in India, Goleman and Davidson were eager to explore the possibilities for personal transformation as part of their academic disciplines. Their graduate advisors warned them that this would be a career killer. At that time the fields of psychology and neuroscience were focused on pathology: the study of neurosis, psychosis, anxiety and other disorders. These young researchers wanted to flip the question around. Instead of studying mental illness, why not look at mental wellness? They wanted to document the well-being attained through the simple, ancient practices they had learned in Asia. Anyone who has made it through a meditation retreat knows that you can experience an altered state on the other side. You might feel greater calm, less anxiety, and more goodwill toward other people. The next thing you notice is that these effects don’t last very long. What Goleman and Davidson wanted to know was whether it was possible to sustain these positive changes over time. So their studies asked how long effects lasted, when to consider them enduring traits, and what caused a transformation to become embodied rather than forgotten. They were also trying to pinpoint the place in the brain that meditation occurred. How do you study a human brain and body? In the early days they looked at heart rate, blood pressure, sweat response, and brain waves using the early iteration of the electroencephalogram (EEG), along with subjective self-evaluating measurements, such as questionnaires. They tested cognition, memory, and even empathy. These were very primitive approaches, but they persisted in their work, convinced by their own experience with meditation that they were onto something. Their first studies were not particularly scientific. Since the two were driven by zeal to share their personal discoveries of the value of these practices, they didn’t set up proper control groups to compare the “after” effects to the “before.” The apathy of fellow academics also contributed to a lack of critical thinking in this area. What’s more, knowledge of the organ systems of the brain was, and remains, a moving target. Over time we have acquired advanced technologies like functional magnetic resonance imaging (fMRI), which is a kind of 3D video of what is happening right now; positron emission topography (PET), an imaging test that reveals tissue and organ function; and computer modeling to interpret EEG readings of brain waves. All of this is to say that brain data and the means for understanding it is far better than it used to be. The authors also came to apply careful attention to the design of their studies, employing good controls and using test administrators who were openly skeptical of the issue under study, all to remove as much of their own bias as possible. As far as interest by the scientific community, it has grown. In 2014 there were 925 studies on meditation published in respected journals; in 2015, 1,098; and by 2016 there were 1,113. The research topic even has its own name now: contemplative neuroscience. At the same time, medical understanding of how the brain works—its organ systems, neural networks, neuroplasticity and genetics—has advanced dramatically since the early ’70s. Our knowledge of brain cognitive and emotional circuitry is much more sophisticated, and the study of the insula, amygdale, limbic system, and prefrontal cortex circuitry has advanced exponentially. A fairly recent development is the hypothesis of the “default mode network” (DMN), a combination of organ functions that appears to be the neurological parallel of the ego. When they started, the authors didn’t know that different meditation techniques produced varying brain/body results. Transcendental meditation (TM), zazen, metta (loving kindness meditation), and vipassana (mindfulness), all emphasize one mental/emotional feature over another; thus organ systems of the brain manifest in distinct ways. They subsequently divided the therapeutic benefits of meditation into four categories: management of stress; control of attention; empathy or compassion; and reduced self-obsession, which they call “lightness of being.” While different meditation styles appear to emphasize one aspect over another, all seem to show improvement. About that question that drove their research from the beginning: does meditation produce altered traits? Yes. Even a small amount of practice benefits the people who try it, and lasts well past the meditation session. But it’s clear that a life devoted to the practice produces profound transformation. Early in the book they divide meditators into categories based on levels of commitment: from Level 5 (the most superficial) to Level 1 (the most seriously committed). The authors refer to this last group as Olympic specimens. When they coaxed a Tibetan lama with more than 60,000 hours of meditation experience into an fMRI scanner for study, researchers watched in astonishment as one marker after another revealed a brain that was nothing like a “normal” person’s in the areas of equanimity, compassion, alertness, and overall well-being. This is a book designed for the general reader. One of its selling points for me is that it does not contain a single diagram. There are no lengthy descriptions of organ function to scare away people who have limited interest in scientific detail. On the other hand, a specialist would grow impatient with lingo like “the brain’s circuit for happiness,” or “the brain’s caretaking circuitry.” That said, the text is heavily footnoted with references to respected journal articles. Not long ago I found myself in a conversation with two sangha members about the virtues of this book. One gently mocked my interest: studying the brain, after all, is a distraction from pursuit of the Way, isn’t it? The second, who had read the book, countered with his opinion: “It’s inspiring!” End of discussion. I have come to use the book in the same way I revisit the writings of old masters like Dogen, Yuanwu, and Ta Hui. After reading it for a bit, a hankering to meditate arises. So I ask you: what’s wrong with that?